The Applewood Farm is located just off Hwy 42 between the towns of Fish Creek and Egg Harbor. The 10- acre farm is beautiful, private and serene. The property includes a barn, a farmhouse and a secluded guest cottage. Feel free to bring your pets and enjoy the walking trails. This cozy yet upscale one-bedroom cottage is perfect for couples and small families. 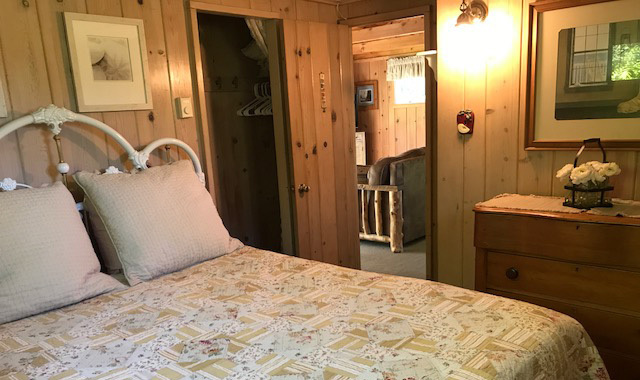 The cottage is conveniently located less than 2 miles from the public beach in Egg Harbor and 4 miles from Penninsula SP. 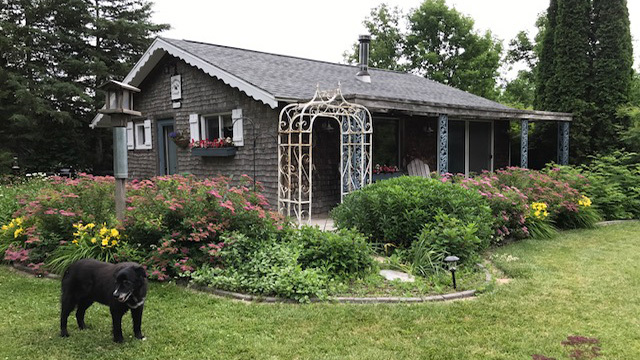 For those who love Door County’s natural beauty and want to get away from the crowds, our nicely furnished and very private cottage is just the place for you! The cottage is situated on the 10-acre Applewood Farm estate. The cottage is tucked away in between pine and apple trees on the far side of the property near Heritage Lake Rd. 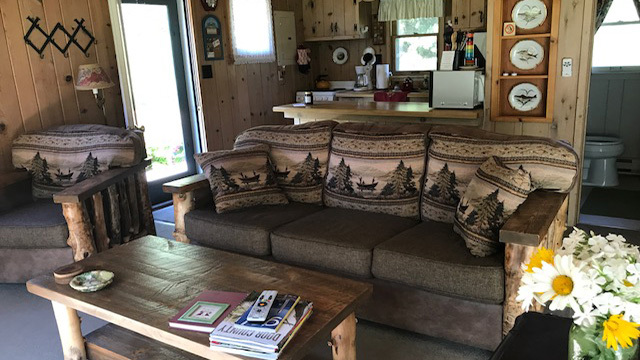 The cottage has its own private driveway and seating area with a bonfire pit. The view out the front window includes rows of Elm trees, and the area around the cottage includes walking paths and acres of wildflowers. The cottage is just a short walk from the Orchards Golf Club. The cottage has one bedroom with a brand new Verlo queen-size mattress. The living room furnishings are from Northern Territory. For extra guests we have two very comfortable high quality self inflating twin air mattresses as well as a Queen size mattress--all with coordinating bedding. 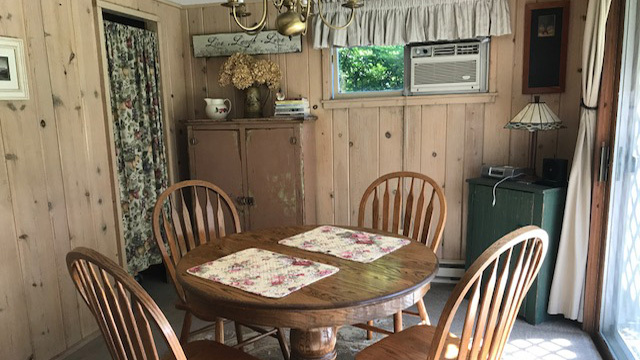 The cottage has an oak pedestal table that seats four in the dining area, two at the breakfast bar, and there is an octagon shaped picnic table outdoor next to the cottage. We also have two Adirondack chairs located on the front porch and four more by the bonfire pit. Note: The maximum number of guests is four, including children. The maximum number of pets is two. Amenities: Fully equipped kitchen, wood-burning fireplace (seasonal only), High Speed Internet (if you must work), satellite/Direct TV, CD player/VCR, air conditioning (window units), full kitchen with kitchenware, microwave, BBQ grill. Linens (Ralph Lauren and Nautica) are provided free of charge, and the cottage also has beach towels, cooler, books, VHS movies and puzzles/games. 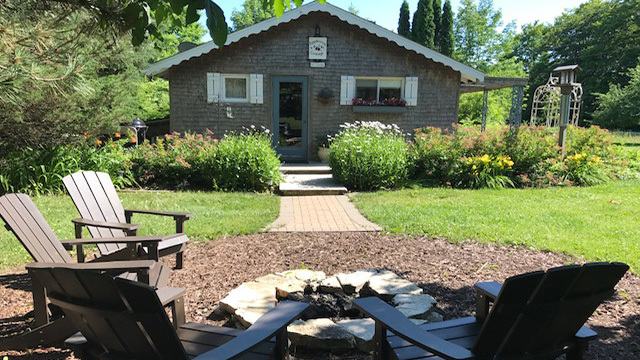 The nightly rate for the cottage off-season (April to mid-June) is $155.00 per night and the in-season rate (mid-June through October) is $175.00 per night. There is also a $10 per night per pet fee. including pet fee. We are open from April to December (weather permitting). Cancellation policy: Cancellations prior to 60 days will be refunded less a $25 cancellation fee. Cancellations less than 60 days will be refunded if the cottage is re-rented for that period. Please call Sharon at 847-331-6961 to make your reservations or if you have any questions or feel free to e-mail sharon@theapplewoodcottage.com.